Welcome to the Million Dollar Journey April 2014 Net Worth Update. For those of you new to Million Dollar Journey, a monthly net worth update is typically posted near the end of the month (or beginning of the next) to track the progress of my journey to one million in net worth, hopefully by the time I’m 35 years old (end of 2014 – yes this year!). If you would like to follow my journey, you can get my updates sent directly to your email, via twitter (where I have been more active lately) and/or you can sign up for the Money Tips Newsletter. The S&P500 took a little breather at the beginning of April, but has returned to form by approaching new highs once again. As of April 30th, including dividends, the S&P500 and MSCI EAFE (international index) were both relatively flat with a 0.7% gain month over month. The TSX, on the other hand, is on an aggressive uptrend returning 2.2% in April. With all the chatter about “Sell in May and Go Away”, there is more volatility in the market, especially in the technology sector. My view? If you are invested for the long term, then stay invested and forget all the noise. Personally, I like to keep some dry powder (cash) ready to be deployed in case market opportunities come up. How did my portfolio do this month? As I’ve been cleaning up my RRSP to contain mostly US and foreign equities, it is starting to track the US market a bit better where our combined RRSPs returned +1%. Our leveraged Canadian dividend portfolio organically gained 2.32% (ie. no cash transfers into the account) and managed to keep ahead of the Canadian index by a very slight margin. The corporate investment account sat in cash again this month and will remain so until I find some value opportunities. In the big picture, for the April 2014 update we are up 0.81% for the month and 17.29% for the year thus far. We are up to $1,197,685 in assets for a total of $970k in total net worth. With the deadline looming, there is about $30k left to go until the big $1,000,000 financial milestone! In February 2014, I introduced the “Corporate investment account” in the net worth statement. A number of readers asked about this account, so I wrote a full post on it here. Also in February 2014, I introduced a tax liability to my net worth statement. The tax liability is basically the amount of tax owing based on non-registered and corporate accounts and amount tax owing from future RRSP withdrawals. More information on the tax liabilities here. You are getting close to your dream. Wow!! I hope I will have a same feeling as yours in 10 years from now. My net worth up by 10.24% in April. Your net worth chart is interesting in that it appears very linear. I would have expected the gradient to rise more steeply as your wealth compounded up over time? Not your best month, but not your worst either. Regardless, 17.29% year-to-date increase is quite impressive. Way to go MDJ! 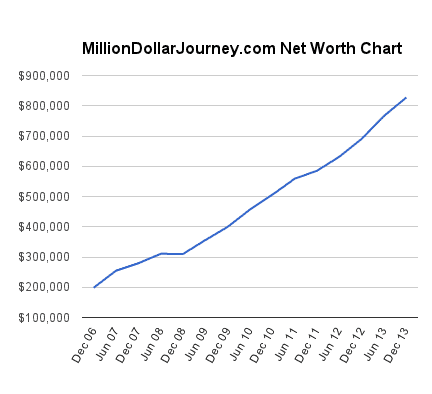 By the way, I love the Million Dollar Journey Net Worth Chart! Your increases have been very consistent since 2006…the line on the chart is essentially a continuous 45 degree angle. Keep it up! I just found your story and very impressed! Thank you for sharing! Thanks for sharing – but I’m with Under the Money Tree — why is the net worth growth so constant? I would have expected some acceleration as the investments piled up. That’s an interesting observation and it would make sense if it did grow more exponentially. I think its because that my investable assets have been a smaller part of the overall net worth up until now. As the investable assets get larger, increases (and decreases) will be more dramatic. It looks like you are making positive process! You’ve done a great job breaking down all the components clearly, and I agree the visual chart of your growth over time is helpful. Thanks for sharing this! So close! I say you throw a huge party once you reach the BIG M! Very good nice to see some real numbers. I few comments – I’m wondering if it’s time to “round off” some of your numbers. Does it really matter if you have a future tax liability of $108,750 or is $100,000 close enough? NW is a good number to keep track of but IMHO not really the only number. I’m new here maybe you have an Income statement somewhere which would show all current sources of income, sources and estimated target income for retirement ? A liquid asset statement with a target of 1 mil of assets you have control of could also be a new target. I am very impressed with your discipline and work ethic. I am anxious for you to reach that 1 million dollar threshold and it’s not a question of if, but when you will get there. I just wanted you to know that I am rooting for you all the way. It’s like watching a long distance runner finally enter the stadium for his final few hundred meters in a grueling marathon run. I am taking a much more aggressive approach to a similar lofty goal. I am documenting everything I think, say and do. It makes for an absolutely inspiring story for those that like the underdog to come out on top. Why do I say that? Well, albeit, I am nowhere near your goal from a financial stand point, I am mentally, spiritually and emotionally on top of the world at this time and nearly completed my plan of action to add (the 4th and final increment) FINANCIALLY to the list. Although, I didn’t know what I really wanted, I did have one idea (for a business) and it wasn’t anything too big or extravagant either. So began my research as I was NOT about to make the same mistakes I’ve done in the past. (that in itself is a somewhat entertaining story on its own) So there was some positive coming out of my failures after all. I knew what NOT to do. Great start!!!! As I researched this little venture I was thinking of starting, I came across many ‘get rich quick’ schemes, right, left and center. Yawn! Grrrrr! It was a lot of time wasting. Then I realized I was Googling the wrong questions. Once I started asking the right questions LO and BE fu*^%$g HOLD. Door, after door, after door kept opening for me. It was like my entire business plan was unraveling right before my eyes and I’d done nothing (yet) to get started. Your blog, Mr. Frugal Trader, came up VERY often in my searches for information which I was easily able to corroborate. For that THANK YOU a million times. I will not share at this point what the revelations are/were as I am in the home stretch of finalizing all the finer points (ugh) and to ultimately put into a business plan, all the while reading some motivational books, walking, eating healthy, being as awesome of a father as I can be, (tonight I coach my very first soccer game ever – and have NO clue at all what to do – I will Google the details just before game time and wing it from there – God help me) trying to be as great of a husband as possible, and ALWAYS, ALWAYS living right here, right now, in this very moment at all times. I’ve NEVER in most of my adult life felt this confident about what I am doing, (albeit I have absolutely no idea how the money I require for financing will come) but I …….. just ……………. well ………. I just know in a very strange and calming manner that I will find it. I have my ideas on what I will try to do. But it seems that, the more prepared and informed I am becoming (thanks in large part to your blog as a starting block) the more confident I am about the eventual results. It’s like putting your hand in a fire. I don’t know the actual mechanics (at the biological level) of what will occur to your skin as your hand burns but I do know with unequivocal certainty that you will burn yourself. I am nearly at that point with my plan. This can be the result of two things. I have either missed something, or overlooked something, or am simply not seeing the bigger picture OR (for which I prefer to believe) that THIS time I did do my due diligence (for which I think I have) and finally have created the map to amass a small fortune (a bit ambiguous but enough money to live comfortably and do what it is I want to do – see: The Four Hour Work Week by Tim Ferris – kind of comfortably) and do exactly what I wish to do in life – all the while remaining on guard at all times against my demons each and every day, for they lurk not far from me always waiting for a moment of vulnerability and weakness to pounce. I WILL make this happen and it will happen in a much shorter period then what you have done Frugal. Not because I am better or more experienced or anything. As a matter of fact you know much, much more then I do about all the technical aspect of things. I am an idealist. I run with the information I have. Only this time (the upteenth time) I am hitting the ground running with both legs, armed with ALL the necessary information (both current and anticipated) to make this (ad)venture a Grand Slam right from the get go. Now that I think about it, right up to this point, it is already a Grand Slam. I will keep you all posted and will (in the near future) have some sort of blog (not like this awesome blog here but) where I will write down my entire story. It’s very unique. It’s original. It’s raw. It’s painful. It’s happy. It laughs and it cries. (a lot of crying) It will be real and unedited. The language is bold yet very powerful. There will be no BS in it. Just real hard facts, about where I cam from, where I went, what I did, how I felt, how I thought. It’s about survival. It’s a journey to find the truth about myself. It’s very much an awesome story, if ONLY I can finish what I have started recently. Either way, I shall post it soon. It won’t cost anyone, anything. But as I said, it’s about truth, the whole and nothing but. Take care everyone, my name is Daniel and I hope speak with you in the near future Mr. Frugal Trader, (if not thank you [regardless] for this awesome and very helpful site) and also to all the readers. Back to the grind and the research. The business awaits. I see that u have not listed a car as an asset. Do u and your wife take a bus to work? How much is your estimated monthly or annual savings for the family, that adds to your net worth calculation? How has your net worth been doing over the last couple of months? I am 50 no job no money homeless uneducated and still have life in me. For what I don’t know. In society I am loser. Not my name or gmail. I live without anything. If I had 5thou I would take a trip and spend it. You all have eay too much money. What do you want so much money for? Ridiculous go spend 30thou on a long trip. Rich people are so boring. Once you have 5or more its enough to have fun…. If you know the secret to making money and saving.. Well then enjoy it. My God all that money… Broke but rich….